A small press book publisher. 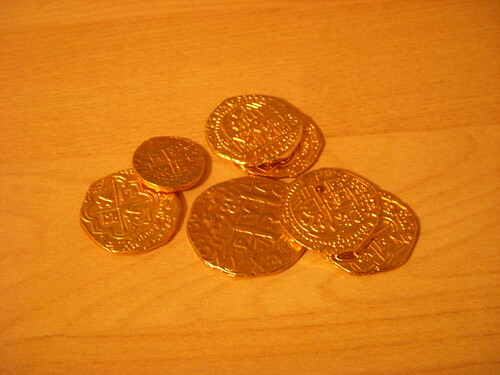 † When using the term “Pirate’s Gold doubloons” to describe the coins shaped similarly to vintage Spanish pieces-of-eight that are adorning the covers of the rare, limited edition James P. Blaylock / Tim Powers bibliography published by Argent Leaf Press, we are of course using the term in a rather loose manner to refer to a type of “fools gold” or “goblins’ gold” as described in Blaylock’s Balumnia trilogy. As such, if you do not get the joke and insist upon prizing one of the decorative coins off of its book cover and haul it out into daylight to attempt to sell it to a coin dealer, you’ll get what you deserve. Postscript: We also must regretfully note that while Powers and Blaylock have not infrequently flirted with the themes of pirates and the inevitable association with their ill-gotten treasures, neither we nor the two authors claim to actually possess any of the said “gold doubloons”. Despite any spurious claims that have been posted on a number of blogs, forums and online discussion groups by Ashbless (apparently posting under a number of aliases such as: “T. S. Cargo”, “G. Ceniza-Bendiga”, and “Tim James”) — we absolutely are not now attempting to “launder ill-gotten gains” through the sale of plundered gold coins through the “front” of this rare book press! Did Stephen King Rip Off the Idea of Pennywise the Clown in “It” from Author Tim Powers? Copyright © 2019. Argent Leaf Press. All rights reserved.